Go to original pattern for design DROPS 45-14. 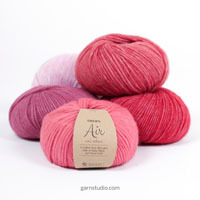 You can get the yarn to make this pattern from	33.00$. Read more. Garter sts, back and forth on needle: Knit all rows. 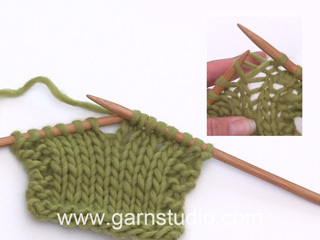 Garter sts on circular needle: Knit 1 round, purl 1 round. Pattern: See diagram. 1 diagram = 1 repeat. Knitted back and forth on circular needle. 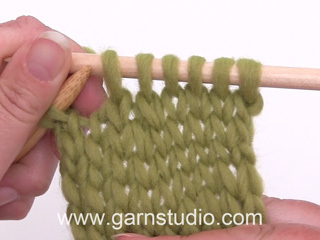 Cast on 101-113-119 sts (incl 1 edge st each side) on needle size 4 mm / US 6 and work 2 rows garter sts. Continue in pattern as follows: 11-17-20 sts of chart M.1, 4 repeats of M.2, M.3, 11-17-20 sts of M.1. When piece measures 31-33-33 cm bind off for armhole each side on every other row: 3 sts 0-1-2 times, 2 sts 2-2-2 times and 1 st 1-2-1 times = 91-95-97 sts. When piece measures 50-52-53 cm bind off the middle 33-35-35 sts for neck and bind off to shape the neckline on every other row: 2 sts 2-2-2 times and 1 st 2-2-2 times. Bind off remaining sts when piece measures 56-58-59 cm. Back piece: Cast on and work as front piece. 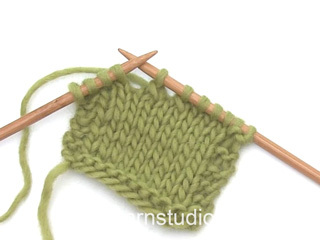 Bind off for armholes as described for front piece. 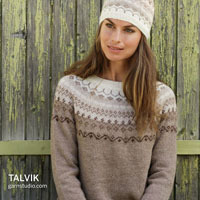 When piece measures 54-56-57 cm bind off the middle 41-43-43 sts for neck and dec 2 sts on neckline on next row. Worked back and forth on circular needle. 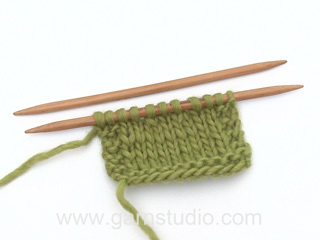 Cast on 45-45-47 sts (incl 1 edge st each side) on needle size 4 mm / US 6 and work 2 rows garter sts. Continue in pattern as follows: 1-1-2 sts of M.1, 2 repeats of M.2, M.3, 1-1-2 sts of M.1. 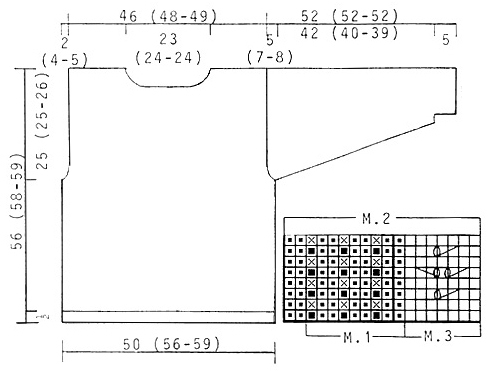 When piece measures 5-5-5 cm inc 1 st each side a total of 28-28-29 times as follows: size S + M on every 3rd and 4th row alternately, size L on every 3rd row = 101-101-105 sts – incorporate inc sts in pattern as you go along. When piece measures 47-45-44 cm dec for sleeve cap each side on every other row: 5-3-3 sts 6-9-10 times and bind off remaining sts. Sleeve measures approx 52-52-52 cm. Assembly: Join shoulders. Set in sleeves and sew sleeve and side seams. Pick up approx 100 to 106 sts round the neck on needle size 3 mm / US 2.5 and work 2 cm / 3/4'' garter sts. If I wanted to make this in xxl how many extra stitches should I cast on? Dear Margaret, we are unfortunately not able to adapt every pattern to every individual request. You are welcome to contact your DROPS store for any personnal assistance adjusting the pattern. Happy knitting! Hallo\r\nBeim Diagramm, sind da nur die Hinreihen gezeichnet, wie werden die Rückreihen gestrickt?\r\nZ.B. bei der Vorderreihe 1 Umschlag/1 M abheben (links oder rechts abheben?? ), wie werden diese beiden Maschen auf der Rückseite gestrickt?? Liebe Frau Bertschinger, alle Reihen sind im Diagram gezeigt, die Diagramme lesen Sie von dem unteren Ecken an der rechten Seiten: die Hin-Reihen werden rechts nach links gelesen (Reihen 1, 3, 5..) und die Rückreihen (Reihen 2,4,6...) links nach rechts. Viel Spaß beim stricken! I am having difficulty reading the M1 chart as 20 stiches for the Size Large sweater. Is the first section of the first row as follows: Knit 1 edge stich, K7 of the M3 chart, then [P2, YOSlip1] 3 times? That is using only 17 stiches from the cast on, but ending with 3 additional stiches made with the YO's. This would result in 131 stiches at the end of the first row. Is this correct? On the opposite side, should you reverse the order so that the P2 bumps up against the Knit stiches of M3? Dear Mrs Cersosimo, in size M, you will work M.1 over the next 20 sts, ie work 2 times M.1 (= 2 x 9 sts) then work the first 2 sts in M1 (= P2) = 20 sts. You will then work: M.1 over the first 20 sts as below, then repeat M.2 a total of 4 times (4x18 sts), M.3 1 time (= 7 sts) and finish with 20 sts in M.1 = 119 sts. Happy knitting! Bonjour Mme Boutin, en taille M, on tricote 17 m en M1 (soit 9 m du diag + les 8 premières m), puis 4 fois M2 (soit 4 x 18 m), M3 (= 7 m) et 17 m en M1 (soit 9 m du diag + les 8 premières m) = 113 m. Dans M3, chaque jeté compense 1 dim, ex au rang 3: 2 m end, 2 m ens à l'end, 1 jeté, 3 m end (= 7 m). Bon tricot! 1. Garntykkelse/strikkefasthed i drops Muskat passer ikke. str. small passer til L! 2. I m3 står der ret! Skal være glat, når der ikke strikkes huller. Udtagning på ærmer passer slet ikke, da de bliver alt for vide! Jeg sjusser mig frem;-) Blot info! Kaere Mie. Hvis du har 20 m per 10 cm og totalt 101 m til forstk, saa skulle du med den rette strikkefasthed komme paa ca 50 cm bredde (101/20*10). Mönsteret ses fra retten, saa det betyder at skal det vaere ret paa retten, saa er det glatstrik og dvs vrang paa vrangen. The chart is showing all rows in pattern as seen from RS. I.e the base for M3 are knit sts seen from RS, so knit on RS and purl on WS. Make sure 1st row is knitted from RS so yo will come on rows from RS.